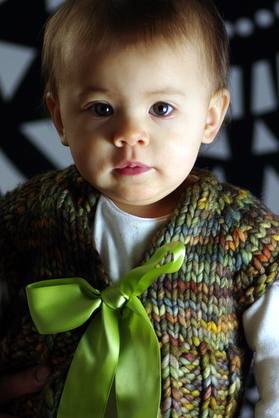 I finished this little sweater last month, but it took me until this week to find a ribbon and finish this baby up The pattern goes super quickly and really could be finished up in an afternoon--then washed and blocked and ready for gifting the following day. It is the perfect last minute gift for a baby shower, and it would be sure to impress since it's so darn cute! This was my first time knitting with Rasta. I won it as a prize during the last Malabrigo March. 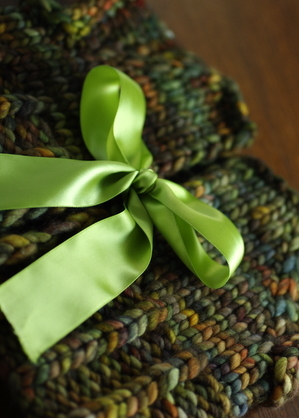 The skein a used is a test color that isn't produced now, but it is a unique blend of earthy colors. The only downside is I only had one skein with no hopes of getting more, so when I ran out of yarn about an inch and a half short of finishing the body I just had to call it good. 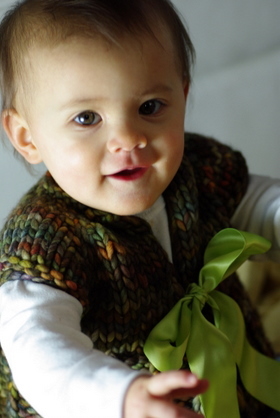 I would have preferred it to be longer, so next time I knit this pattern I'll definitely purchase two skeins of Rasta. Working with such a bulky yarn is quite a different experience for me. I'm not used to things moving so quickly! Also, when weaving in ends, things can get a little tricky. I was a bit concerned about the extra bulk they would add, especially around the underarms where there were a few ends to weave in, so I split the yarn carefully in half and wove in the two ends in separate directions. 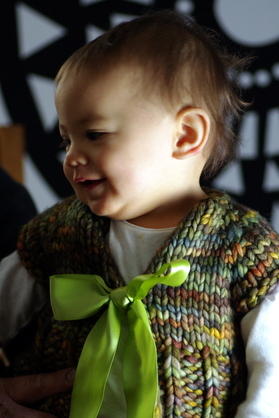 The pattern is a quite simple top-down sweater written for one size--6-9 months. It would be easy to upsize though, which I will probably do next time I make this pattern since Serena is already on the verge of growing out of this one!